Northview volleyball will host a Dig Pink Tournament beginning at 4:00 this afternoon along with Flomaton, W.S. Neal and Escambia County High (Atmore). The tournament will be a two court set up with junior varsity and varsity participating. All proceeds from the gate will go to the Side-Out Foundation for cancer research. Northview is also selling shirts for the event and all those proceeds will also be donated to the Side-Out Foundation. The schools will also host a hospitality room for survivors, referees, and coaches. Survivors present at the game will get in free and receive a special treat from the volleyball players. The Side-Out Foundation funds breast cancer research and support with “cutting-edge clinical trials at renowned medical institutions. . . which has extended the lives of people with Stage 4 breast cancer.” In addition to cancer research, the Side-Out Foundation also provides support services for cancer patients and their families. 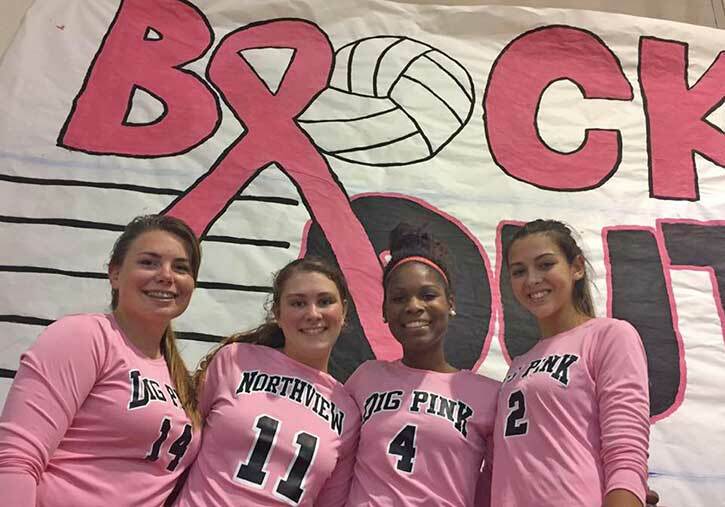 Pictured: Ready to “Dig Pink” are Northview volleyball players (L-R) Courtney Grim, Brittanie McLemore, Jamia Newton andd Ashtyn Carnley. Photo for NorthEscambia.com, click to enlarge. (2) No Harrassing Comments. If someone says something bad about you, don’t respond. That’s childish. (3) No Libel. That’s saying something is not true about someone. Don’t do it.